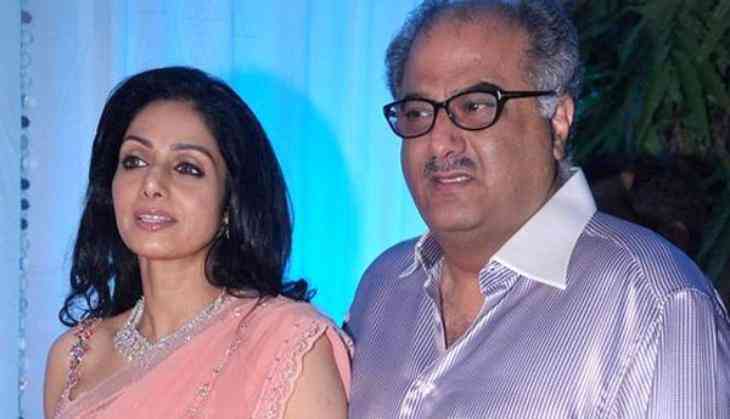 Film producer and late Sridevi's husband Boney Kapoor opened up about the death of his 'Jaan' last week, to his close friend and film critic Komal Nahta. Boney recounted the "detailed account of what exactly transpired on the fateful evening of February 24" to Nahta, who has now shared the conversation in a blog on his Twitter handle. The couple was in UAE for their nephew Mohit Marwah's wedding at the time of the incident. After the nuptials, Boney had left for Mumbai while Sridevi stayed back in the hotel. Boney, however, decided to suprise his wife, and booked a ticket back to Dubai. "On 24th morning, I spoke to her, when she told me, 'Papa (that's how she addressed Boney), I'm missing you.' I also told her that I was missing her a lot. But I didn't tell her that I would be joining her in Dubai in the evening," Nahta wrote after his conversation with Boney. "Janhvi (their elder daughter) had seconded my idea of going to Dubai because she was scared, her mom, not used to being alone, would misplace her passport or some important document if she was alone," the post read. He also recounted that there had been only two occasions in the last 24 years when the couple had not travelled together abroad. "Sridevi had travelled alone on two brief foreign trips - one to New Jersey and the other to Vancouver - for two appearances," he said. "Although I didn't accompany her on those two trips, I made sure that my friend's wife was with her on both the occasions. The Dubai stay was the first time Sridevi was alone for two days - 22 and 23 February - in a foreign land," Nahta's post read. Sridevi got emotional after Boney surprised her and they "hugged, kissed and chatted for almost half an hour". It was after this, that Boney asked her for dinner and Sridevi went to bathe and get ready. Thereafter, Boney watched cricket on the television for around 15-20 minutes "but was beginning to get restless because he was aware that being a Saturday, there would be a rush in the restaurants. It was around 8 p.m. then". Boney, became impatient and called her from the living room. He rushed to the bathroom when she didn't respond. After calling out to her twice, Boney lowered the volume of the TV set. However, there was still no reply from the bathroom following which he walked to the bedroom and knocked at the bathroom door. "The unsuspecting husband, kept calling out Sridevi louder than before, but got no reply, which was unusual," Nahta wrote. He then panicked and opened the door which had not been bolted from inside. "The tub was full of water and Sridevi was immersed completely, from head to toe, inside the tub. Devastated, he reached out to her but watching her motionless, he feared the worst. Sridevi had drowned! Boney's world had come crashing down. He himself was drowned in sorrow and misery as the centre of his world had passed on to another world," Komal Nahta wrote. An autopsy report released by the Dubai Forensic Department said that Sridevi died to "accidental drowning" in her bathtub and did not suffer a cardiac arrest. Traces of alcohol were also found in her blood. "Whether she first drowned and then became unconscious, or she first fell asleep or unconscious and then drowned, nobody will, perhaps, ever know. But she probably never got a chance to even struggle for a minute because had she moved her arms and legs in panic while drowning, there would be some water spilling out of the tub. But there wasn't a drop of water on the floor outside the tub area. The mystery will remain unsolved," Nahta concluded.